Panasonic used the IFA 2007 expo in Berlin to launch the DMC-L10, its new flagship digital SLR. The company's second digital SLR - following on from the DMC-L1 - has a more conventional design than its quirky predecessor, but keeps faith with the Four Thirds interchangeable lens mount system. The basic specification is fairly standard SLR fare: A 10.1-megapixel sensor, 3fps burst mode, all the usual focusing and shooting modes and a 2.5-inch LCD. Panasonic is making a big deal of the fact that the LCD can rotate through 270 degrees, calling the feature 'full-time live view'. At the least, it does promise improved compositional potential, and the 207,000 pixel LCD plays along with automatically adjusting brightness. The DMC-L10 retains the Venus Engine III image processing system from the DMC-L1. This is designed to work best with the Leica D 14-50mm lens that the camera ships with. Photos can be shot in 3:2, 4:3 or 16:9 aspect ratios. The widescreen option allows images from the DMC-L10 to be enjoyed in high-definition widescreen - on a Panasonic plasma TV, of course. 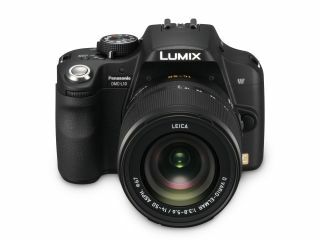 The Panasonic Lumix DMC-L10 will ship with its 14-50mm lens as a kit badged as the DMC-L10K. It will be available in October, and should have a similar price in Europe to the suggested US price of around $1,300 (£650).